I love to eat. I’m vegan (no meat, no eggs, no dairy). I love to eat junk food. 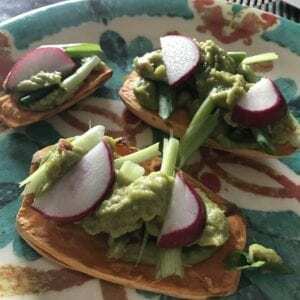 I know eating healthier in a WFPB (Whole Foods, Plant Based) way feels sooooo much healthier! But junk food tastes so good! But let’s be honest, junk food to me is something that tastes delicious more than it tastes healthy. Yes, an oxymoron, but if I’m more focused on the yumminess rather than it being good for me beyond my tastebuds, plus no awful food coma afterwards, bonus! I had been seeing sliced sweet potatoes toasted in the toaster as a sub for bread for toast. Now, I love sweet potatoes (especially when they’re over roasted in their skin to the point that they caramelize and there’s a slight burn to the point where it’s a vegetable that tastes like candy – how amazingly YUM is that?! ), but the idea of it being used as a substitution for bread? Um, my feels are all the NOs and all the EWs. It just doesn’t seem right. Buuuuttttt….. I have been seeing it quite a bit over the last few years, and I’m willing to give something a try at least once to rule it out, but most of the time these tries results in surprising faves of mine in all areas of my life! My first attempt of toasting the sweet potato slices in the toaster seemed like the easiest, but it was a total dud. It just ended up burning all the crumbs in the toaster (yeah, I need to clean that thing) and the slices didn’t cook at all while getting stuck in the toaster. So I moved on to the next attempt, roasting them in the oven. The result? OMG-amazingly, surprisingly good! And not too sweet, it complimented the fresh and savory aspects of the toppings! Slice sweet potatoes into slices about 1/4″ thick. I used a knife and a great deal of sweat and muscle, but I’ve heard that a mandolin slicer will make this easier and more accurate! Arrange the sweet potatoes on a baking sheet or pizza pan. I like to use one with holes, like this one. It allows greater air circulation around the slices and they cook faster and crispier. Crispy food, yum! Bake in the oven at 350 for 25 minutes. You want it to be crispy and baked, but not too soft. If the sweet potatoes seem too raw, leave them in the oven a little longer. Turn the oven to “Broil” and cook the sweet potato slices for about 4 to 5 minutes longer, checking to make sure that they are crispy but not burnt. Once they’re the right “doneness”, remove from the oven and allow them to cool. Top with your favorite toppings! 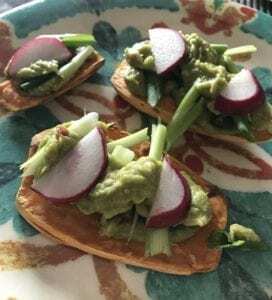 I wanted avocado toast, so I used prepared guacamole from Aldi, slices of radishes, chopped green onions and sliced jalapeños for a pop! I imagine this would taste great with peanut butter and bananas!